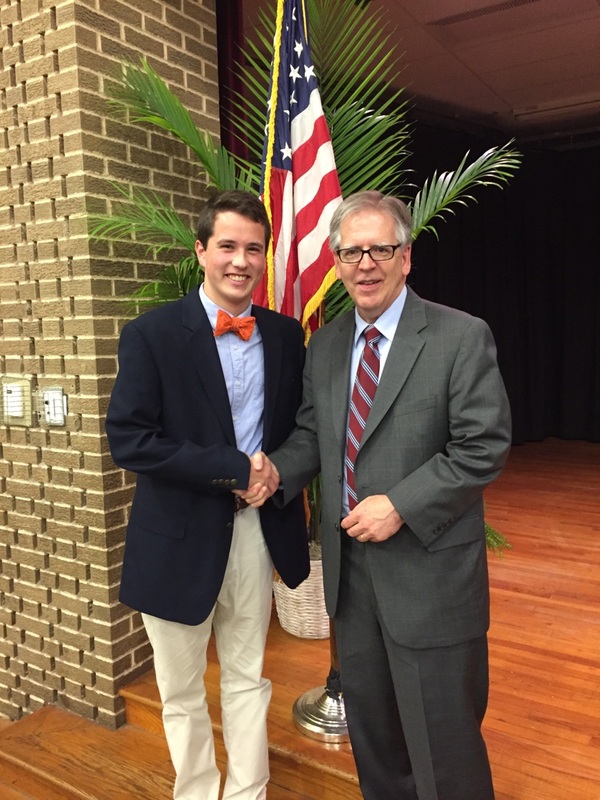 Last week, members of the Class of 2016 were celebrated at Kennett High School’s Award Night. The following is the list of awards that were presented that evening. One of the most academically competitive endeavors in the Nation is the National Merit Scholarship Program. These winners represent some of the best and brightest minds in the country. 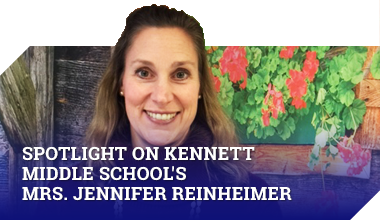 These students have met the rigorous academic requirements that confer a distinctive place in representing Kennett High School across the United States. UNITED STATES MARINE CORPS AWARDS recognizes outstanding performances in academics, athletics and music. All three fields exemplify the qualities that are inherent to the Marine Corps – smart, tough and elite. GIRL SCOUT GOLD AWARD recognizes young women committed to serving her community by using her combined talents of strength and leadership. This year’s recipients are Rebecca Ploener and Julia Sharp. Rebecca, as a member of the high school’s Drama Club, saw the closets were disorganized and a rental system was needed. Rebecca and her team took inventory of the costumes, placed useable items in labeled bins and donated the other items. She created a website to manage the costume rental and to make the Drama Club advisor’s job less stressful and time consuming. Julia discovered that her peers were struggling to find volunteer opportunities in the community. After connecting with local organizations and businesses, Julia and her team created a website, which is linked to the school’s site, and a pamphlet listing more than 40 organizations, as well as community events. Not only did Julia and her team provide new volunteer opportunities, but made students more aware of the needs of our community. SOCIETY OF WOMEN ENGINEERS AWARDS is a national-level Certificate of Merit Program to recognize and honor high school girls who have demonstrated excellence in the study of both mathematics and science, and are active citizens of the school and/or community. This year’s recipients are Kate Doroba, Rebecca Lustig, and Julia Sharp. ALMA NEWLIN EDUCATIONAL FUND SCHOLARSHIP is presented to students with an un-weighted cumulative grade point average of 3.0 or higher and must be planning to enter a human healthcare-related profession. This year’s recipients are Becca Shoemaker and Joseph Wikol. WIDENER UNIVERSITY HIGH SCHOOL LEADERSHIP AWARD is designed to recognize those high school students who possess the character, courage, and competencies to effect positive change. This award was presented at the National Constitution Center in Philadelphia. This year’s recipient is Gemma Erickson. DELAWARE VALLEY ASSOCIATION OF SCHOOL BUSINESS OFFICIALS SCHOLARSHIP is awarded to a student who plans to attend an academic or vocational program post high school and is interested in a career in business. This year’s recipient is Kalie Standish. FRIENDS OF MUSIC UNDERCLASSMEN AWARDS are awarded for excellence in band, chorus and/or orchestra. 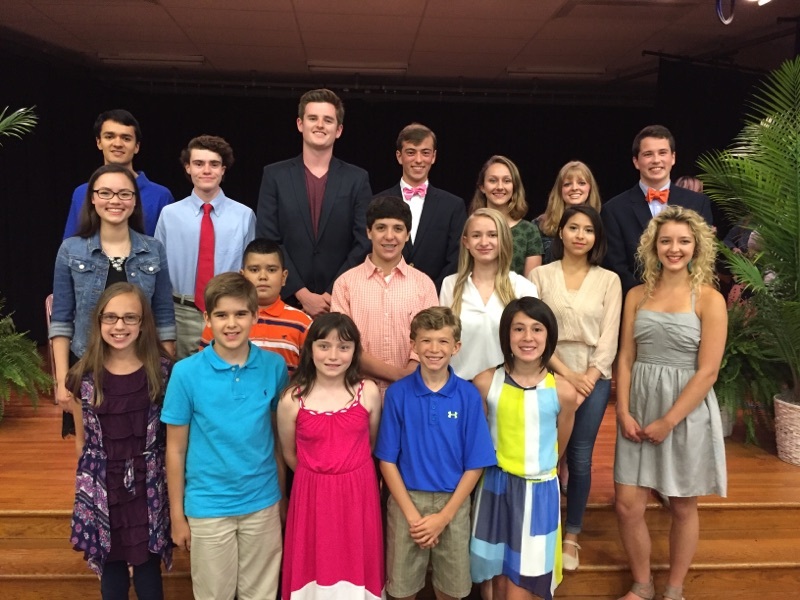 FRIENDS OF MUSIC SENIOR AWARDS are awarded to graduating seniors for excellence in band, chorus and/or orchestra. THE BOB SCARLETT PRIZE is awarded to the senior female athlete and THE MILMAN E. PRETTYMAN PRIZE is awarded to the senior male athlete for their outstanding sportsmanship. Casey Kollmeier, Michael Claricurzio, Madeline McCunney, and James “Stanton” Jones. THE KENNETH A. WEBB CUP is awarded to the senior female athlete and THE WILLIAM A. SHOEMAKER MEMORIAL CUP is awarded to the senior male athlete who, in the judgement of the coaches, has demonstrated individual proficiency and unusual effort in a sport. Jordan Goddard, Ryan Eberle, Mary Nichols, and Beau Schmeusser. THE DR. D. DUER REYNOLDS MEMORIAL CUP is awarded to both a senior female and male athlete who has earned the school letter and has contributed the most to athletics during their entire high school career. Bailey Reigel, Aubrey Robinson, and John-Paul Dean. WIN AWARDS are presented to the students who have participated in all WIN activities and assigned community services during their senior year. Nathalie Davalos-Sanchez, Kenbeli Jacome Garcia, Rocio Jaimes Cruz, Maria Juarez-Castaneda, Maria Ortiz Ortiz, Yulisa Oseguera Lopez, and Anjelica Rodriguez. LONGWOOD ROTARY CLUB AWARD is awarded to a WIN student who shows exceptional character and whose words and gestures mirror the Rotary motto: Service above Self. Yulisa Oseguera Lopez. HERMANITAS SCHOLARSHIPS are awarded to students who have participated in all Hermanitas activities and assigned community services during their senior year: Kenbeli Jacome Garcia, Rocio Jaimes Cruz, Maria Juarez-Castaneda, Maria Ortiz Ortiz and Yulisa Oseguera Lopez. RENSSELAER POLYTECHNIC INSTITUTE AWARD honors our junior class recipient with the Rensselaer Medal Award Certificate for outstanding academic achievement in the study of mathematics and science. This year’s recipient is Christian Samulewicz. CONGRESSMAN PATRICK MEEHAN GOOD CITIZEN AWARD is given to both one male and one female senior who best exhibit characteristics of leadership, courage, and scholarship. Communities thrive when people go beyond what is asked of them and make an effort to help all. These citizens have demonstrated an inspiring commitment to school and country. This year’s recipients are Becca Shoemaker and Joseph Wikol. DAUGHTERS OF THE AMERICAN REVOLUTION GOOD CITIZENS AWARD honors an outstanding young person in the senior class who demonstrates qualities of a good citizen. Our school winner of the prestigious DAR Good Citizen Award was recognized for her dependability, service, leadership and patriotism. This year’s recipient is Zoe Livingston. BEST OF THE CLASS salutes for academic excellence. Our recipient was invited to participate in the WPVI-TV Channel 6 ABC taping for “Best of the Class of 2016” at the Adventure Aquarium in Camden, New Jersey. The event included activities such as guest speakers and networking opportunities for these accomplished future leaders. This year’s “Best of the Class” is Julie Bates. STUDENT SERVICES PRINCIPAL’S LEADERSHIP AWARD is sponsored by the Student Services Company and is given to a student who exemplifies the qualities of Leadership, Scholarship, and School Service. This year’s recipient is Meliton “Tony” Gomez Bustos.